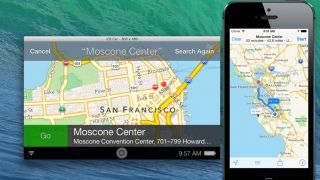 iOS in the Car looks to be starting its navigation-fueled engine in new developer videos that acts as moving demos to last week's screenshots leak. There's a minute-long preview of what Apple's in-dash GPS software could look like is courtesy of the Kyiv, Ukraine-based developer Denis Stas. He explains how to enable iOS in the Car through an iOS simulator's 800 x 480 resolution window. It displays his current location and offers directions when the buggy software wants to work. Denis Stas cautions other developers that this iOS in the Car preview is unofficial and quite unstable. The same unofficial label applies to the video posted today by Dublin-based developer Steven Troughton-Smith, who leaked last week's screenshots. Troughton-Smith was able to display his current location as Apple's Campus at 1 Infinite Loop through the simulator. He also showed that desired destinations could be spoken to the in-dash unit. They could also be typed into an iPhone that seamlessly relayed to the car's navigation. Apple's foray to in-car navigation is expected to launch alongside iOS 7.1, but Troughton-Smith's video appears to sport a dated look compared to last week's screenshots. That's likely because Troughton-Smith captured the iOS in the Car video running on iOS 7.0.3, and he alerts viewers to the fact that the user interface may be in for a redesign. He also notes that the final version should include support for multiple resolutions and inputs via touchscreens (which he thinks will be single-touch), hardware buttons, wheels and touchpads. He didn't find a keyboard UI, meaning voice recognition may be the only input available when looking up directions through the in-dash unit. Also not present in this video but promised by Apple is Siri Eyes Free to handle calls, texts and music controls. The company has so far revealed that iOS in the Car will be compatible with iPhone 5 and iPhone 5S and it's partnering with more than a dozen vehicle manufacturers. How iOS in the Car will be implemented in new cars and if there will be standalone units available for older cars remains to be seen. Intel's Jarvis will be faster than Siri because it works offline.